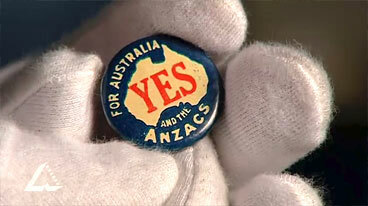 Video clip synopsis – William Hughes, “The Little Digger”, campaigned twice for national conscription to boost an Australian army decimated by World War One. Broadband MP4 hughes_bb.mp4 (17.7MB), suitable for iPods and computer downloads. William Hughes and the 1916 Conscription Badge is an episode from the series The Prime Ministers’ National Treasures, produced in 2007. During World War 1, also known as The Great War, Australian soldiers fought on the Western Front (the border area between France and Belgium) between 1916 and 1918. This was Australia’s main war involvement, far bigger than the fighting at Gallipoli in 1915. Australians fought in the war as fellow members of the British Empire – with the Australian Government not hesitating to consider Australia also at war when Britain declared war on Germany. In 1916 the Australian Government, under Prime Minister William Morris (Billy) Hughes, called for conscription of Australian men to supply replacements for the war casualties; voluntary recruiting did not seem to be producing sufficient numbers to supply the front line. “The Little Digger”, as Hughes became known, held a referendum (really a ‘plebiscite’, a popular vote that indicated people’s opinions, but was not able to change the Constitution) in which the people of Australia had to indicate whether they supported or opposed conscription. The referendum caused great divisions in Australian society and within Hughes’ own governing Australian Labor Party. The referendum was very narrowly defeated. In December 1917 Hughes, who by this time had been expelled from the Labor Party for his advocacy of conscription and was now the leader of the Nationalist Party, a combination of the pro-conscription Laborites, and the Liberal Party, held a second referendum. A slightly increased majority rejected the proposal, but with great social hostility and disruption being caused by the issue. The irascible Hughes was a popular and dynamic politician despite a tendency to feud. He worked with 100 secretaries during his term in office, helped found the Labor party, the Nationalist Party, and the United Australia Party and was ousted from all three. He formed the Commonwealth Police Force after a dissenter socked him with an egg during a conscription campaign and the state police force did nothing. William Hughes (1862 -1952) was Prime Minister of Australia from October 1915 to February 1923, and a member of the Commonwealth Parliament from the first sitting in 1901 until his death in 1952. The 1916 conscription badge is held at the Powerhouse Museum in Sydney. What if an Australian government decided to introduce conscription today — should it also apply to women? Research this, and organize a debate on the issue: That women should be subject to the same conscription as men. A second element to look at and debate is the issue of whether women should be in combat in the same way as men in the Australian Defence Force. Organise a debate on the issue: ‘That women should have the same front line combat roles as men’.